All natural cat litter is quickly growing in popularity as people realize the potential health concerns and environmental destruction associated with clay and silica-based cat litters. Natural cat litter has the benefit of being compostable, virtually dust-free, and made of more renewable and sustainable sources than traditional clay litters. These eco-friendly cat litters come in a variety of materials, the most popular at the moment being paper-based cat litter, corn-based cat litter, and wood-based cat litter. However, there are also varieties made from walnut shells, coconuts, wheat, bamboo, and grass seeds. If you’re trying to figure out what is the best natural cat litter, here is a list and description of the most popular eco-friendly cat litter available in the US, by primary ingredient. I’ve based the below descriptions for each eco-friendly cat litter brand on the manufacturer’s website. Because different consumers have different preference and experiences, it’s best to scan through a few of the descriptions and reviews to get a general sense of how the litter is expected to perform on the factors that are most important to you. Why Avoid Clay Cat Litter? Why Avoid Silica / Silica Gels Cat Litter? A pine cat litter made 100% from reclaimed pine (i.e. no new trees are cut down to make this litter). It is available in clumping and non-clumping formulas. The litter is made from the sawdust, a byproduct of lumber production. This sawdust is then compressed into pellets. Clay litters are currently the most common choice for cat litter as it is the cheapest, most widely available option. Clumping clay litters come from a specific type of clay called sodium bentonite, which is very good at absorbing moisture. Clay expands in volume when wet, resulting in good clumping, but accidentally or improperly ingested can be dangerous to cats. An additional drawback is that even the ‘dust-free’ clay litters usually emit a small level of silica dust. Ingested or inhaled (even through normal use), this dust can be detrimental to both cats and humans by damaging the lungs and respiratory tract. From an environmental perspective, the process of mining clay is environmentally destructive. Usually surface mined (or strip-mined), this means that miners must remove all the soil and rock on top of the clay to extract the clay deposits. In the U.S. alone, more than 1 million tons of bentonite was utilized for litter. Disposal is another issue as the clay does not degrade in landfills. Clay litter is the plastic shopping bag of the litter world: a convenient solution that, in one-use, converts non-renewable natural resources directly into waste. However, I should note that in a scientific study assessing a cat’s preference for three types of litter: clay, silica gels, and wood pellets, the cats showed a clear preference for clay. Silica crystals/gel cat litters are popular because they are highly absorbent and control odors well. However, crystalline silica can irritate the respiratory and digestive tract of both humans and cats. It can also potentially cause silicosis/lung disease or lung cancer. Additionally, from the cat’s point of view, some cats do not like the feel of the crystals on their paws, though compared to the potential to develop lung diseases, that seems a minor inconvenience. I want to note that many of these natural cat litters claim to be flushable. However, I do not include this information because I strongly believe that cat poop should not be flushed. As such, flush-ability should be irrelevant to litter selection. Infected cats may carry the eggs of Toxoplasma parasites in their poop. As these eggs have an extremely tough outer shell, sewage treatment facilities may not be able to kill them before returning the treated wastewater into the open waters. A study by the University of California found that more than 40% of live otters and more than 60% of dead otters along its waters were infected by Toxoplasma gondii. A direct link to cats has not yet been established, but considering that cats are the only animals that are known to carry the eggs of Toxoplasma parasites, there is a strong theory that cat poop might be the source. Better safe than sorry – protect the sea otters and don’t flush your cat poop. Beyond sea otters, Toxoplasma gondii may very well become a widespread human public health problem with the potential to infect the brain and increase suicide rates. As cat caretakers, we need to be responsible for the proper disposal of our cat’s poop. 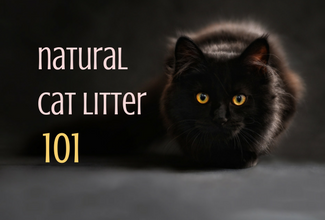 Given the environmental destruction and potential health implications associated with traditional litter choices (clay & silica gels), it makes sense that natural cat litters are growing in preference and popularity. The above natural cat litter brands offer benefits and drawbacks, as included in their descriptions. Choose one of the eco-friendly cat litters that align with your preferences and dispose of your cat poop properly. If you generally change the entire litter box weekly anyways, perhaps Yesterday’s News’ paper cat litter or CatSpot coconut litter is a good choice for you. If you are strictly zero-waste, you may be interested in ökocat cat litter for its fully compostable litter and packaging. I can attest to World’s Best Cat Litter as being the best one I’ve used so far (My two cats and I have been happy customers for the last 4 years), but I have not tried the more than 20 brands listed above, including the variations within each brand, to make a definitive statement about the “best natural cat litter”. Additionally, my experiences may not align with your own depending on your sensitivity to smells, or the humidity/airflow/sunlight of your litter area, all of which may make your experiences with a particular litter vastly different than someone else’s. Based on the information above, I would choose a natural cat litter that appeals to you. Try a bag out for a month and if you or your cat(s) don’t take to it, perhaps try a different type until you find one that you love. Come back and let me know what you think is the best natural cat litter on the market. Lastly, if you’re interested in how to live more zero-waste with your cat, read this article next! I have 2 strays (1 possibly feral) that I took in almost a yr ago now. Having lived on their own (1 for almost 7 yrs) in the AZ desert before she decided to trust me forever – I was so afraid of them not adapting to becoming inside cats and/or not using a litter box – so type of litter was a huge concern. I have been lucky – all around. For the past yr, I have been using 7Pets Garfield (cassava) litter & love it – though it does track, despite its claims not to. Unfortunately, the only local store that carried it (in 10lb bags – as online prices/ sizes are ridiculously expensive! ), had just stopped about 3 months ago. It was a bit expensive, but was always on sale – I must’ve been the only one buying it! I then took a chance with their own grocery store brand of grass seed litter, which has been great – and also tried buying a big bag of Blue Buffalo’s Walnut shell litter – which seems ok BUT is so dark & heavy that its hard to tell how dirty the box is or where the waste is. I also clean by hand every day – every other, w a vinyl glove on. To be perfectly honest, while I have a 20lb bag of BB walnut shell litter sitting there, I actually went out & bought 2 more 10lb bags of the GRASS SEED litter & am planning on sticking with that. GRASS SEED litter is just so light & almost fluffy feeling – and absolutely have had no problem tracking (though not much, walnut litter does track initially out of the box). The color is perfect for telling when its time to clean & where the waste is. The clumping is excellent too – which is what I loved so much with the cassava litter, and it really goes a LONG way. Theres no need to ever dump the whole box out & only need to refresh whats been used/ removed. There is never any odor either. It is a bit expensive for other brands online, but would be worth every penney (when my grocery store brand would not be available on East Coast, when I move back) I absolutely cannot say enough about how FANTASTIC grass seed litter is! So anyone stuck on the fence about whether to give it a try or not – absolutely don’t hesitate! I just love everything about it – natural or not!!! Of all litters, I would give it a 10 out of 10 score! We switched to Blue Buffalo walnut litter and couldn’t be happier. We buy one 26 pound bag every two months (with 5 cats! ), and so it costs much less than clay. Plus we can toss it in our compost, so it’s much easier to deal with. Thanks for sharing! Such a great article and very informative! I honestly did not know there were safer alternatives to cat litter. I love this! It’s so important to choose a natural, eco friendly cat litter and also stay mindful of how that litter can potentially affect your health and the health of your cat. I absolutely agree that the World’s Best Cat Litter is aptly named and super awesome. It’s my go to for my cat. Yesterdays news is wonderful too if your pet just had surgery (like a neuter or spay) to avoid getting anything in the healing incision. And I love it for my rabbit! No fear if he decides to chew on a pellet :). Thanks so much for sharing your take and showing people that little type matters! I will definitely keep these alternative litters in mind as I really don’t like using the clay litter we currently use. It’s very dusty and I know definitely not the most environmentally friendly thing one can do. I’ve never thought of adding litter to compost. I’ll look into that further also as I’m not sure I’d want that in my garden, but do love the idea of no waste.